Yes, you did read the headline correctly. After featherweight champ Jose Aldo forced the planet’s premier mixed martial arts promotion to scramble for a new UFC 153 main event, middleweight king Anderson Silva (Pictured) has agreed to serve as a last-minute substitute to fight Stephan Bonnar in a light heavyweight affair. Our partners at USAToday reported the October 13th shootout Wednesday evening. 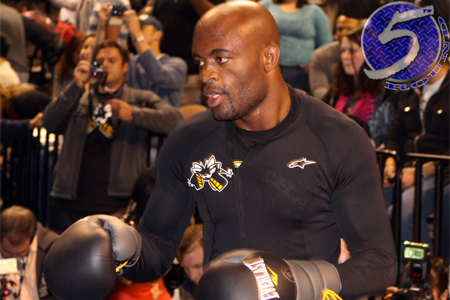 Silva previously professed his 2012 campaign was a wrap after beating Chael Sonnen in July. However, “The Spider” offered up his services to salvage UFC 151 when Jon Jones declined a last-second scrap with Sonnen to save the September 1st event, but it was too late. The baddest middleweight in bare feet was willing to compete in a 205-pound bout because he wasn’t in a position to make middleweight at the time. It seems like that will once again be the case. Of Silva’s 15 Octagon forays, two have been at light heavyweight. He easily knocked out James Irvin (2008) and Forrest Griffin (2009), respectively, in those outings. After running the reverse trifecta, Bonnar has bounced back to rattle off three consecutive victories. The former “The Ultimate Fighter 1” finalist was last seen taking a decision win over Kyle Kingsbury at UFC 139. HSBC Arena in Rio de Janeiro, Brazil hosts the fiesta.